Rather than being a crowdfunding operation, WayTools and TextBlade are following the Tesla model. You can order a keyboard and you can pay for it, but you're going to wait for the release -- and you can get your money back at any time. So after four years, you have to wonder whether TextBlade is ever coming out and you've got to be puzzled about what could be delaying it. 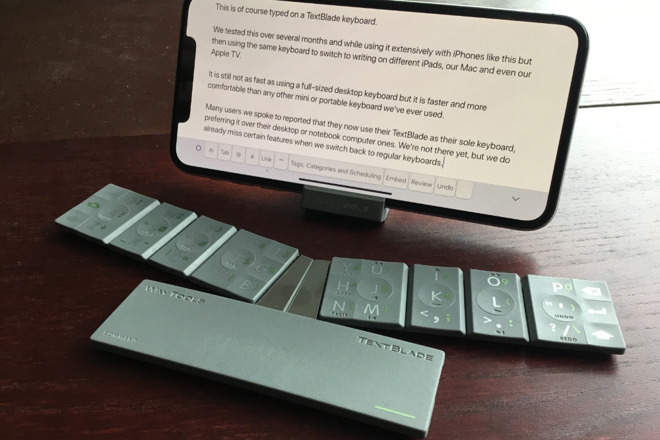 Ultimately, you also have to think about whether the TextBlade is worth waiting for -- and that's one thing AppleInsider can answer. WayTools says it has worked with both Apple and Google to improve those companies' implementation of Bluetooth, specifically in iOS and Android. We checked WayTools' claims with its users who have been following each iteration of the TextBlade -- and we also checked out iOS release notes from Apple -- and it's true. TextBlade has caused improvements in Bluetooth. Fascinating vaporware, but pretty much vaporware nonetheless. I placed an order almost exactly 4 years ago. Still have nothing. The most aggravating thing isn't that I haven't been blessed as part of TREG with receiving one, it's the 4 years of lies about when it will ship. It's never an honest, "we have no idea," it's always changed to be one season ahead of where you are. I wouldn't recommend anyone place an order unless they actually ship. Right now, I agree with Neilm. It's VAPORWARE. While it might be vaporware, some folks have apparently received them and really like them. I just checked out the website and will wait until they have Bluetooth 5 (they only use Bluetooth 4 now) and then I'll place an order. 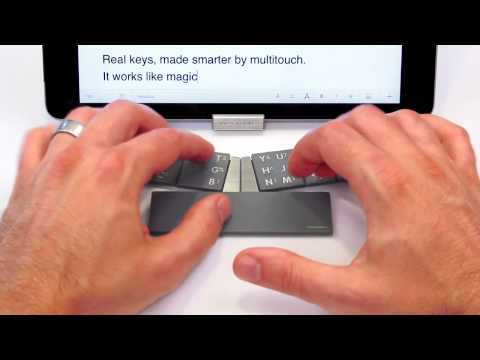 Certainly looks interesting, as the keys are all programable and there is an included app to do that. Four years and they can’t deliver because of Bluetooth implementation? Not sure I can buy into that explanation. During those four years there have been countless products released using that technology, so I don’t see how that can the the obstacle. I was ready to order one while reading this article and watching its video, but when I got to the part of the “reason” for the delay, I figured I’d better wait until they release it. Neat tinker toy. Nothing more. Looks like a couple decades of progress negated. Why snyone would do that to themselves is beyond me. But hey, if it’s a fun toy for product reviewers, at least someone gets to enjoy it. Must be tough for the folks who review everything to actually enjoy the process sometimes. But the vast majority of regular users would throw it out the window in 10?minutes. I’m one of the lucky folks that has been included in the TREG group. I’ve been using the TextBlade for a couple of years, and it is definitely not a toy. It’s been weeks since I’ve used a different keyboard. It’s a more pleasurable typing experience when at my desk, and the portability is incredible. I’m attending a conference this week and didn’t even bother to bring my computer because I’m just as productive with the TextBlade and my iPhone. Once they start shipping, I would not hesitate to recommend a TextBlade to anyone who spends a significant portion of their day on a keyboard. I have had a several test units over the past few years. By now it has become the only keyboard I use. I have just written a book (which is in final editing) using only the TextBlade and an iPad and it’s by far the most comfortable and versatile keyboard I have ever owned. 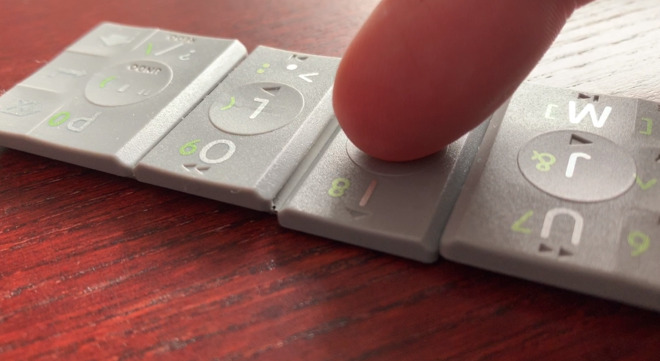 Don’t be fooled by its diminutive appearance and slightly ‘tech-toy’ looks: this is a professional, ergonomically brilliant and super portable keyboard all rolled into one tiny package. I've seen lots of "revolutionary" keyboards come and go. They all share one thing in common. Reviewers love them. A small subset of people use them and love them. Most people go back to the regular keyboard. If I ever get a chance to try this I might. But I sure as heck ain't shelling out ~$120 based on a video. Boy that's the truth. Every rev of BT promises to be more stable and reliable. And every rev is still mediocre at best. I finally gave up on the Magic Keyboard and Magic Mouse that came with my iMac and replaced them with a wired pair that hasn't missed a beat. My BT headphones and speaker work okay, but for keyboards and mice, I just have had no luck. Having had a TextBlade for the past two years and posted videos of my own on YouTube, I can certainly assure that this is real. TextBlade goes with me everywhere and I use it on every device. Such a better feel to typing than any other keyboard I’ve used. TextBlade has a very low cognitive load for use. I have a consistent interface with all my devices and don’t have to remember shortcut differences between operating systems. TextBlade translates that all for me regardless of when I am on Windows or iOS or Android and others. Mobile computing with items I keep in my pockets is now real for me. Travelling for work I don’t even have to take a bag. The customisability is amazing. I can map any keystroke to any key. I can adjust the sensitivity to certain letters to my own needs. The built in layers are so intuitive to use my acclimation period was only a few days. The community of TextBlade owners has been very supportive and even assisted WayTools to develop a pre-paired Bluetooth dongle to use with devices that may have USB but not native Bluetooth support. To the computer it looks like a USB keyboard but is actually Bluetooth! Very excited that many others are soon going to be able to experience this. Must also be said that if anything ever goes wrong with TextBlade, WayTools’ response has been exemplary. Very quick to get to root causes allowing me to get back to work with a minimal of fuss. They could ship a bluetooth version right now - or months ago - but they weren't satisfied. Thus the effort to get Apple and Google to fix some things on their end as well as doing what they could to deal with it themselves. Also, it probably isn't fair to talk about bluetooth items shipping as if it's all the same thing. The TextBlade uses bluetooth low energy and from what I've seen, that is more problematic than other bluetooth. For example, I might be fine with my Apple or Logitech keyboards that use regular bluetooth, only to have issues with the TextBlade when I began testing. But also have the same problem show up with a Microsoft portable keyboard that also used BT-LE. Besides, there are other things besides bluetooth. Just because something is mentioned in more detail doesn't mean it is the only thing they feel they need to make better. It certainly isn't a toy and it is unlikely any but those most unwilling to take some time to adapt will throw it out in 10 minutes. If they do, hopefully they'll throw it my way! I think only one Treg member has reported not using it much. Might be a special use case where either the TextBlade isn't ideal or it could be he didn't take the time to adjust and customize it to better suit his needs. But lots of testers have reported ditching their other keyboards. I can see some not giving themselves time to adjust and I suspect that is one reason WayTools wants to minimize other possible issues so they don't add to the challenge. Sure, it is perfectly understandable to not order before it ships. Every time someone asks me about mine, I always tell them two basic things - that it is a great keyboard (best I've ever used) AND that it has been delayed since Spring of 2015 over and over again so it is their risk to decide whether to order (and get some extras thrown in for free) or wait. Since someone mentioned not wanting to pay $120 when it isn't shipping yet, I should point out that it is still $99 for pre-orders with the extra stuff. Most likely if the price goes up, it will be when it ships so those two go hand in hand. For William Gallagher, you mention you aren't nearly as fast with the TextBlade yet, but give no comparisons. That would be useful. For example, on a regular keyboard before the TextBlade, I could do about 55 wpm at 97% accuracy. For me, it took a few weeks, I think, to get past that (I did work hard at it and also didn't switch back and forth between keyboards). I presently run in the mid-60s at 98% or better. But since usually I'm typing things like this post, thinking about what I want to say as I type it, my speed is more like 45 wpm. So it wouldn't really matter if my test speed didn't match my old speed (though I'm happy it got better). Then there are the other advantages that can offset any temporary reduction in speed. Like how easy it is to edit, without reaching for the mouse. This greatly increases other areas of computer use that a typing test doesn't measure. Maybe the best point I can make is that even after a few days with the TextBlade, and while I was still awkward and couldn't type at my old speed, nor had gotten used to many of the extra advantages the TextBlade has, I still didn't want to go back to my old keyboard. It is just such a good typing feel, no stretching for keys, that it was still better to use. The story fails to point out that this was not always a Tesla-like project in which you knew there would be an undetermined wait. In the beginning, it was shipping in 2-3 weeks. Then six more weeks. Then next quarter. It was only after they got to be a year late that they created the idea that if you didn’t wait anymore, you could have your money back. There's no getting around the fact that the first people in were lied to. 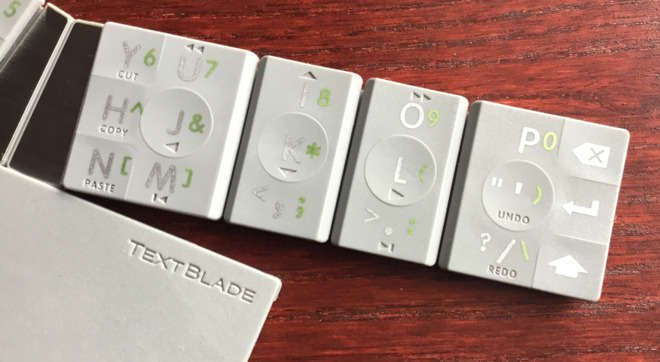 The TextBlade is a truly transformational device. I don’t mean this in a small way, in the sense that it is a remarkable and incredible innovation in the technology. I mean this in a big way: TextBlade has the ability to transform how you interact with technology. I ordered the TextBlade thinking it would be something to take with me to occasionally type on my phone, and was lucky enough to receive a test unit. This is not just a small, elegant, portable keyboard. 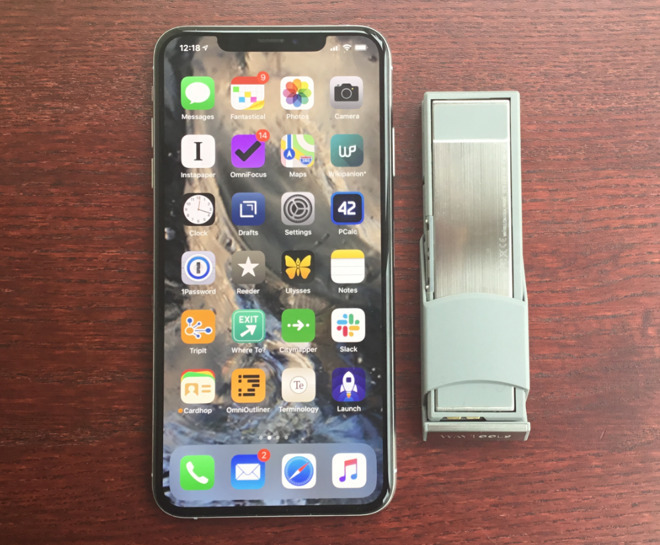 It is a smart device in its own right, a small elegant gadget that you can use to communicate in a textual way with all of your other devices, and which miraculously folds into a compact thin unit that can go along with you everywhere. The TextBlade knows intent. There are key combinations (chords) that “mean” certain things, and it will send the proper characters to your device based on which operating system you are connected to. After decades of constantly reaching out from my typing for a trackpad or mouse because of my refusal to learn arcane key combinations and shortcuts that are unique to each device I now gladly stay on my home keys while typing, editing, and commanding. Want to page up, select a word or sentence, copy, paste, increase volume, change apps? It’s the same whatever device you are on. Want to have 3 or 4 devices on your desk — just hit a jump chord and work or respond on each device as you look at it. Want to set up your own macros or keyboard mappings? You can do that too, and the key mappings can be specific to each device you are jumping to in order for the intent to be the same on each device (or different, depending on your desires). When I think of the incredible power, and then look down and realize that I’m typing on a simple 8-key device rather than a 101+ key monstrosity, I feel like things are right with technology. I look forward to a moment when this is widely available (and when all those I’ve shown it to during my encounters can finally get one too). A number of us with TREG units have not been active commenters on this site, but you can see our consistent activity on the WayTools forums. Said another way: these are just fake accounts created by one person to shill a product. It was only after they got to be a year late that they created the idea that if you didn’t wait anymore, you could have your money back. Uh, I don't think so. Their deal was that you could even cancel 30 days after receiving it. First, I suspect most of us only have one post for the same reason I did - I wasn't a regular appleinsider reader (thus not a poster) until the article came up which I and the others knew a lot about. Second, no one is feeding you a line. None of us can guarantee that it WILL ship (though we expect it will). None of us will tell you to preorder. We may point out the benefits of preordering AND the potential risks. For me, even though I'm risk adverse, this one item I did preorder back in 2015 because I thought it just might be great. I have never preordered anything else. But now that I have it, I will say it is great. That doesn't mean everyone will like it. Some may have special situations where it isn't the best choice. For example, if you want to be able to stop your car and type on your lap, it isn't going to work unless you put something flat and rigid under it. Which just happens to be how I type virtually 100% of the time. I never have it sitting on my desk when typing. It's always on my lap. OTOH, you could stick the TextBlade to a vertical surface if it is made of steel (because the TextBlade is magnetic). I think the group that may have the biggest issues are those who write code, because of the key combos to get oft-used symbols. But we have TREG members who code. I don't so I can't address it as much as I'd like. From what I've read from others, it may depend on what kind of coding. I also know some have worked out customized layouts to deal with the problems. YMMV. But even if coding is a problem, most people aren't coders. I have always felt the bigger "problem" is just getting people to give it the time and effort to adjust. There are multiple levels to this. First, just for alpha characters and basic punctuation that is all on the main layer, thus no special combos needed, they still have to adjust to the particular angle of the keys as well as the different reach. But the reach is EASIER! Still have to adjust to it. This is the kind of stuff you may have to do with any given regular keyboard. But the second thing is a bit more complicated as you access numbers and many symbols on the "green layer". This is where you hold down the space bar and hit the appropriate key. It's easy - certainly easier than the shift key once you get used to it because your thumb is typically right above the space bar anyway. It's also easy because you are no longer needing to reach for the symbols (or numbers). They are at or immediately above or below the home row. However, you still have to adapt to it and I have no doubt that some simply won't make even a minimal effort. Third, there is user error - which the ordinary user may blame on the TextBlade. When you hit the wrong key on a regular keyboard, it is generally very obvious. But with multiple characters (3-6) on one key cap, it is naturally less obvious and people will tend to think they did it right even when they didn't. To give you an idea of how this can go, in early testing, sometimes I'd get the wrong character. Now, sometimes it was the TextBlade's fault (those problems have been solved), but there were times I get an error thinking I was right, but catch myself right when the error occurred. I then, without looking down, moved my finger closer to the part of the key for the character I wanted (just in case I was out of position). I'd still get the wrong character! So I'd do it again, with the same result. And then again - so 3 times with the same error, even though I had moved in the right direction. Surely the TextBlade messed up! Nope. I'd look down where my finger was and, surprise, it would still, even after those adjustments, be solidly on the wrong character! I suspect some people wouldn't realize they goofed and get frustrated early on. These things are unavoidable so I figure WayTools wants to minimize any possible issues they can control at a pretty high level (though not perfection). I could tell within one day, in spite of the significantly greater issues early on than now, that I didn't want to use any other keyboard. No, I couldn't type on it as well instantly, but things were just easier that it wasn't hard to see the benefits. Speed was "good enough" in short order and was back at full speed within 3 weeks. And now, while I could touch type before, that didn't include numbers and symbols - too far away for me to do without looking and I didn't need them enough to practice them. But I easily do them with the TextBlade. There are a lot of things the Treg members will be able to help newbies with when it does ship, because we've gone through them ourselves and have learned how various customization options (not just basic keyboard layouts) can help. It's not vaporware. I'm typing on one right now. It is amazing, but the firmware is *very* difficult to perfect, because the TextBlade does so much. Four years and they can’t deliver because of Bluetooth implementation? John Gruber of Daring Fireball says it best: “Next year it will work great” should be the motto of Bluetooth. Early on in the testing process, fellow testers and myself encountered bugs in *every* vendors' implementation of Bluetooth Low Energy. I reproduced a crasher in Apple's BLE stack. There's lots of non-trivial aspects to doing a Bluetooth keyboard correctly. Not sure I can buy into that explanation. During those four years there have been countless products released using that technology, so I don’t see how that can the the obstacle. For sure, there's a lot of crap shipping out there. All Apple had to do to take the crown for the wireless earphone market, was make the very first pair of wireless earphones that was *reliable* and wouldn't cut out and disconnect at random times, and would pair up and work immediately without having to power cycle, reset the earphones, reset the phone, etc. Sounds easy? Only Apple was able to do it. And they had to make their own W1 silicon to launch AirPods. I was ready to order one while reading this article and watching its video, but when I got to the part of the “reason” for the delay, I figured I’d better wait until they release it. There's no pressure at all, and if you need the $99 now, you can wait until it has shipped. But then you'll have to fight for availability. The keyboard is that good. I am extremely disappointed in this article - primarily because it doesn't provide an honest look at how WayTools has handled its pre-orders. I saw an article in January 2015 about the TextBlade, and I ordered it. At the time, the release date was end of February 2015. For the next couple years, WayTools would quietly change the shipping date by a month. Then, they started changing it by a quarter. Each time, it looked like launch was imminent. Even their blog posts are about getting the TextBlade into everyone's hands. Sure, there are TREGs. I was one of the first to order, and I have hardware beta testing experience. The day they announced TREG, I signed up. Instead, they seem to choose outspoken people on their forums in hopes to string the rest of us along. That's not a slight against the TREG people. Most seem to really enjoy the product. What it does show is a company that wants to string along a purchase base. So, they are going with the Tesla model? It would have been helpful to tell those ordering the device that they are going to wait 4+ years. Also, they are not emailing their customers. I have received exactly one email about my order - the one confirming my order and that my credit card had been charged. The only other times I hear from them is when I send an email asking about an order. According to FCC rules, they are required to contact customers when delays exceed 30 days to confirm that they customers still wants the product. They have not done that. They do, however, allow you to get your money back at any time. Eventually I did (after 4 years and 3 months) WayTools is not a company that you want to do business with. If they eventually ship the product, buy it from Amazon. AppleInsider, this is your opportunity to be a voice for "millions?" who are being scammed. I have filed a complaint with the FCC, and I have heard rumblings that there is talk of a class action lawsuit.